Tales, tall and short, about fly fishing Sylvan Dale’s private trophy trout lakes, bass ponds and the Big Thompson River. Ever ask a fly fisherman how he did? Did you believe his answer? We fly fishing fanatics are sometimes known to exaggerate stories about our catch. Hey, it’s part of the fun! 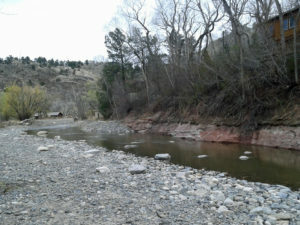 But at a river habitat restoration workshop on March 9 at Sylvan Dale Ranch, a group of anglers pledged to tell only the truth. Their job? Take a fish inventory to see how trout are recovering in the Big Thompson River 18 months after the devastating flood of September 12, 2013. After hearing speakers talk about techniques of river habitat restoration, five avid anglers set out to do some “fish sampling.” Armed with fly rods and their favorite trout flies, with notebooks and pens in pockets, they fished for three hours pledged to keep careful track of size, type and condition of all trout caught. The results: twenty one healthy, bright-colored rainbows, ranging from 12 to 16 inches, caught mostly on small nymphs, and released back into the water. How can trout recover so fast from a deposition of rubble and silt up to twelve feet in depth from a flood that left the river corridor looking like a moonscape? Bugs, mostly. 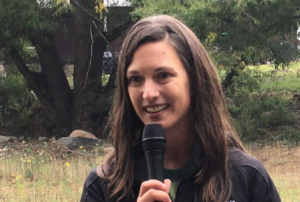 A “bio-blitz” of aquatic insect life, carried out by another group of workshop participants, found a healthy population of mayflies, stoneflies, caddis flies and midges in the river. Mother Nature can be destructive, but also has awesome healing powers. 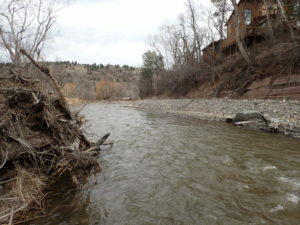 We’re pleased by the Big Thompson River recovery so far, and we’re looking forward to even greater fly fishing when we implement a grant this fall to place boulders and downed trees in the river channel to create even more spectacular trout holding water.